Can you thread wood like this? And make a nut to fit. 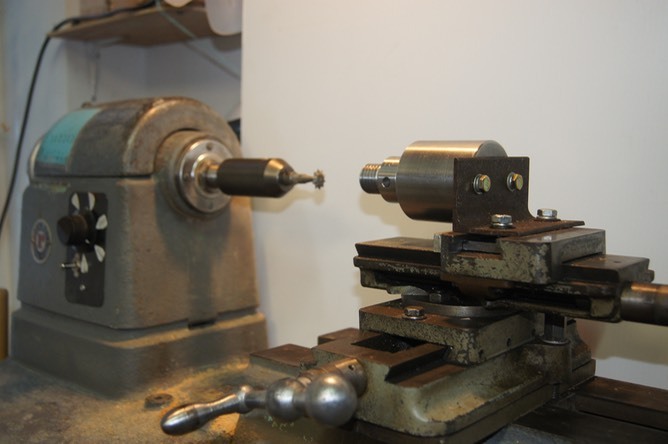 I am going to show you a series of pics of the cutter and it’s mount for the lathe. Below is the cutter it’s self. 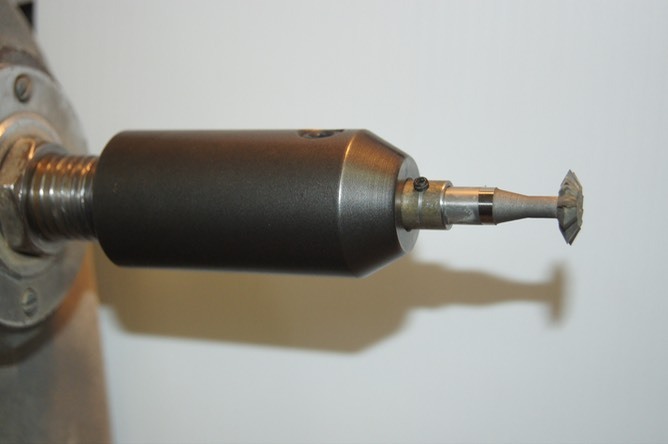 It has a double bevel 60 degree 3/4” head mounted on a 3/8” shaft that is meant to go in a milling head. This cuts a perfect thread with the correct angles needed. My supplier, KBC Tool, sells this for around $50.00. It’s made for threading metal so it should last for ever cutting wood. This is the End Mill holder which has a MT#2 taper that fits in my spindle of my lathe. Other tapers are available. Because I wanted to be able to thread deeper than the length of the cutter would allow, I made an extension shaft for the cutter that would go into the End Mill holder. The shaft extension is a 1/2” X 4” and it is bored out to take the 3/8” cutter shaft and I put a set screw in it to hold the cutter on it’s flat spot. This allows me to thread a box that is deep or to cut a long thread. The End Mill holder has a 1/2” hole that is 4” deep so you can set the cutter to any length you like. The heart of the Threader Jig is the lead screw assembly. As seen here, you see the 8TPI on the left end. This is to mount my Nova 4 Jaw chuck on which will allow me to hold everything I want to thread. Then next is the shoulder that the chuck tightens up to to keep the chuck straight. It also has 3 holes in it so you can put a small bar in so you can turn it out of the hub on the right. 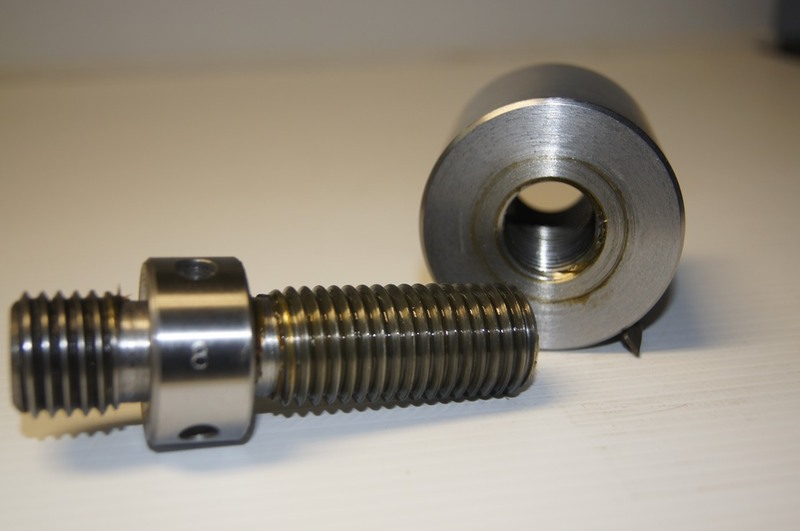 The hub and lead screw are made with a very tight fit so there is no flop or back lash (this is very important) I have tried for years to get this right and I finally found a machine shop that can do it right. This is the 12 TPI set. So here is a pic of the chuck mounted on the lead screw assembly holding a small box ready to be threaded. 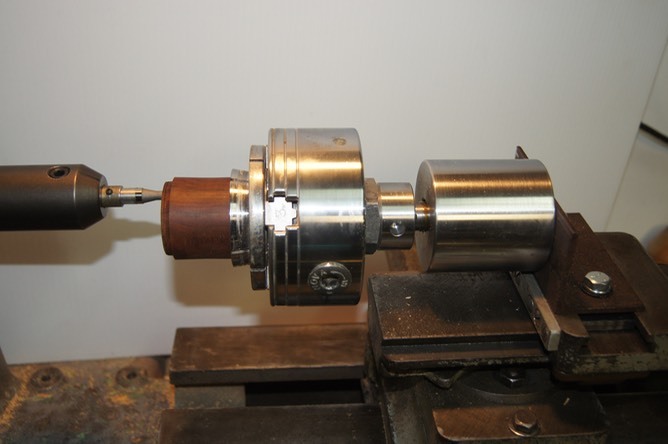 The lathe spindle holding the End Mill holder and cutter will run at 2000 to 2500 RPM and will cut a very smooth thread. I have a Cross Slide Assembly that fits my Delta Lathe made by Delta many years ago. This allows me to move the Threading Jig into position in both X & Y axis. Getting the height right was done during the making of the mount bracket which holds the Threading Jig on the cross slide assembly. It’s just a short piece of 2” angle iron with the holes bored in the right spot.This also allows me to change to the other Jigs that are set for 8, 10 & 12 threads per inch. They all fit on the same mount and are the correct height. The cross slide assembly can be easily moved along the lathe bed to get the project you are working on into position for threading. If you don’t have a cross slide for your lathe, Grizzly Tools sells a Cross Slide Vise for around $60.00 and I will make the mount plate to fit your lathe if you don’t want to. Here is the Threading Jig lead screw removed from the nut or what I call the hub. These two parts have to be made right or your threads will be no good. If you can’t find a machine shop to make these parts, please contact Ron Pawlyshyn of RPM Industrial Inc. 306-764-0768. His team will fix you up. This is the 8 TPI set.